Sadly, Lachenalia liliflora, an indigenous hyacinth with strikingly beautiful creamy-white flowers tipped with purple, is on the critically endangered list. Lachenalia liliflora consists of a single fleshy bulb about the size of a large marble, with two strap-like lanceolate leaves up to 150 mm long. usually, but not always, densely covered with little bumps called pustules. The inflorescence can grow up to a 250 mm tall and is covered with very delicate, slightly raised, creamy-white flowers that have magenta tips. The leaves will start to emerge a few weeks after the first rains in autumn, but the flower comes much later in middle to late spring, generally only appearing as the leaves are dying back. 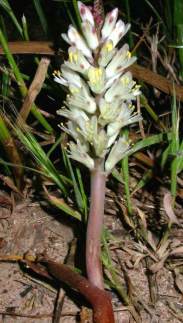 Lachenalia species are generally restricted to the winter-rainfall parts of South Africa and Namibia. L. liliflora, however, now critically endangered, is currently known from only three populations, these in the area between Durbanville and Paarl in the Western Cape. The distribution was once far more extensive but, through farming and urbanization, L. liliflora has been driven almost to extinction. On a recent visit to one of the Durbanville populations I found, to my surprise, that half the population had been destroyed by bulldozers in order to make way for a new housing development! Ironically the only thing protecting the existing bulbs were some rather large alien Eucalyptus trees between which they managed to find refuge! Many hyacinths — known world-wide especially for their heavenly scent and beautiful colours — originate in the Mediterranean. In southern Africa we have our own selection of indigenous hyacinths, the Lachenalia, one of the biggest genera of the hyacinth family. While some Lachenalia species have quite nondescript flowers, others have strikingly beautiful flowers and are used commercially in horticulture, rivalling many of the more common, well-known hyacinths on the market. The genus Lachenalia was first described by Joseph Franz Jacquin, son of a Baron Joseph Jacquin, who was studying the collections of these new plants in the Schönbrunn Palace Gardens near Vienna in the late 1700s. The genus name is after Werner de Lachenal, a professor of botany in Basel, Switzerland. Jacquin later described L. liliflora in about 1798, liliflora referring to the funnel-shaped flowers resembling certain species of Lilium. 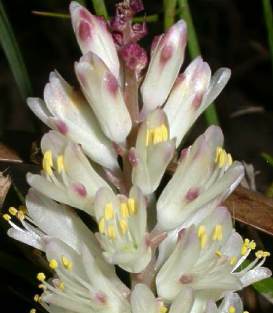 Lachenalia species are typical winter-growing deciduous bulbs that go completely dormant during the hot summer months. 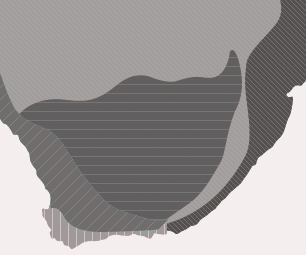 L. liliflora would typically grow in lowland renosterveld areas favouring hilly slopes and flats but today much of this area has disappeared to farming and urban sprawl. The soil consists mainly of clay and is usually quite stony, which helps the plants to avoid being eaten by moles. They are probably pollinated by bees during the day and perhaps also at night by moths. They survive the hot, dry, fire-prone summers by going dormant and only shooting with the autumn rains. Many lachenalias are used commercially in horticulture and rival many of the more common, well-known hyacinths on the market. L. liliflora is one of the most beautiful and most endangered bulbs on the planet. L. liliflora is very easy to grow as a pot subject and can be very rewarding. The soil medium should be fairly well-drained and consist of about half coarse, washed sand and half finely sieved compost. Plants should be kept in a sunny position and will grow very happily outside during the winter months providing it doesn't drop below freezing. In order to keep the leaves green when they come into flower, watering should be maintained until flowering time. They are easily propagated by leaf cuttings, which can be removed from the plant by slicing them at the base of the leaf blade. These leaves are then half buried in a very sandy medium and left in a cool place out of direct sunlight. The soil should be kept on the dry side to avoid the leaves rotting, but the humidity should be quite high. If these conditions of dry soil coupled with humid air prevail, within a few months small bulbils will appear along the cut edge at the base of the leaf. Eventually the leaf will wither, but the bulbils can be planted like normal bulbs the following season. Flowering will take place after one to two years. They are also easily raised from seed, which should be sown in autumn in a similar medium used for cultivation with a thin layer of soil placed over the seed. The seedlings should germinate within about two to three weeks. Flowering will take place after two to three years. They don't have many pests apart from snails and worms (which can be removed by hand) and mealy bug, which should be treated with a systemic pesticide. Not much fertilizing is required for these bulbs as they are not generally very hungry, but they wouldn't be adverse to the odd splash of a diluted, low-nitrogen, liquid fertilizer. Duncan, G. 1988. The Lachenalia handbook. National Botanical Gardens, Kirstenbosch, Cape Town.